Chisholm Forged A Place For Black Congresswomen Shirley Chisholm is often remembered as the first black woman to run for president. But before she went for the top spot, the former educator had already made history: Forty years ago this week, she won a seat in the mostly male, mostly white House of Representatives. In 2003, Chisholm talked to Tavis Smiley about her congressional terms and presidential campaign. Learn about all the black women who have served in Congress. When asked about Shirley Chisholm, the first thing many people mention is her historic, albeit unsuccessful, 1972 bid for president. This is understandable, especially in an election year that has seen major African-American and female contenders for the executive branch, considering that she was the first black woman to throw her hat in the presidential ring. But before she ran for the top spot, Chisholm had already made history. Forty years ago this week, she won the House seat for the newly reapportioned 12th district in Brooklyn to become the first black woman in Congress. "I was the first American citizen to be elected to Congress in spite of the double drawbacks of being female and having skin darkened by melanin," Chisholm wrote in her autobiography, Unbought and Unbossed (also her campaign slogan). "When you put it that way, it sounds like a foolish reason for fame. In a just and free society it would be foolish. That I am a national figure because I was the first person in 192 years to be at once a congressman, black and a woman proves, I would think, that our society is not either just or free." Chisholm's reference to herself as "a congressman, black and a woman" is indicative of both the entrenched prejudices she faced in Washington and the constituents to whom she sought to give a voice there. In 1973, freshmen representatives Pat Schroeder, the first congresswoman from Colorado, and Ron Dellums, an African-American from Oakland, Calif., were placed on the House Armed Services Committee. According to Schroeder, this was much to the chagrin of committee chairman Rep. F. Edward Hebert (D-LA), who had not been consulted about the new appointments and expressed his displeasure at the first meeting of the session. "He went into a rage about how awful it was," Schroeder says of Hebert, "and how the only thing he still had control over was the number of chairs at the table. And since African-Americans and women were only worth half a House member in his eyes, he made us share a chair." By that time, Chisholm — who was, by Hebert's math, one-quarter of a congressperson — had already served two terms in Congress and sought the Democratic nomination for president. "That's the environment Shirley was working in," Schroeder says. Chisholm was one of three African-Americans to enter the House in 1968, bringing the total number in the chamber to nine, the largest in the nation's history. "It was an historic moment, which meant that we could not come into the Congress and just represent our congressional districts," says former Rep. Louis Stokes of Cleveland, who, along with former Rep. William Clay Sr. of St. Louis, comprised the group of blacks in Chisholm's freshman class. "There was a sense of hope from minority and black Americans across the country that we had to represent black Americans wherever they were. We tried to be, at that time, all things to all minorities." Chisholm attempted to do this throughout her career. While advocating for general liberal causes such as a withdrawal from Vietnam and abortion rights, she honed a particular focus on education — which was her profession before she entered public office — as well as economic security for families, racial fairness in hiring and other issues that affected minorities in her district and elsewhere. So when, upon assuming office, the congresswoman was assigned to the House Committee on Agriculture, she felt the placement was ill-suited to her resume and the concerns of her urban community. She made a bold appeal of her appointment, eventually taking to the chamber floor with a speech in which she said, "I think it would be hard to imagine an assignment that is less relevant to my background or to the needs of the predominantly black and Puerto Rican people who elected me, many of whom are unemployed, hungry and badly housed, than the one I was given." Shortly thereafter, she was reappointed to education and training panels on the House Veterans' Affairs Committee. During her tenure, she would go on to join the House Education and Labor and the House Rules committees, as well as help to found the Congressional Black Caucus in 1971 and the Congressional Women's Caucus six years later. Carol Swain, author of Black Faces, Black Interests and a political science professor at Vanderbilt University in Nashville, says that Chisholm's bold move as a freshman showed her desire early on to provide "substantive representation" to her minority constituents, rather than merely being a symbolic black face in Washington. "She was more than window dressing," Swain says. In her first term, Chisholm was one of 10 female members of the House. She repeatedly said that throughout her political career, she found discrimination against her gender to be more ubiquitous than similar obstacles she encountered because of her race. Schroeder says that when she first came to the House four years after Chisholm, the lack of women was striking. "We had no women anywhere: no women pages, no women at the doorkeeper's office, in the parliamentarian's office, no women Capitol Police," she says. "You couldn't go into the gym, where a lot of deals were cut – couldn't even go out on the balcony, which is off the Speaker's office. ... The attitude of a lot of women when I got there was, 'Aren't we lucky they let us in here?' "
Chisholm, however, did not share that attitude. She hired mostly all women – more than half of them black – to fill her staff positions. And she made a point of reaching out to new congresswomen, such as former Rep. Cardiss Collins (D-IL), also African-American, who says Chisholm would sit next to her on the floor and "tutor me in the issues" while explaining the inner workings of the House. When it came to legislative initiatives important to women — from securing federal funds for daycare programs to guaranteeing minimum wage for domestic workers — Chisholm was consistently and vocally at the fore. She also maintained a lifelong passion for education and was a vehement supporter of federal assistance for schools. "She had this very high profile with people across the country — and women in particular — that she understood women's issues," Schroeder says. "It came from her being a teacher and from her presidential campaign." 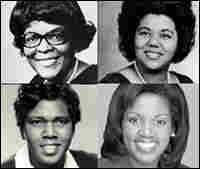 During Chisholm's final term before her retirement in 1983, out of 19 black members of Congress and 21 women, three were black women. To date, there have been 26 black women representatives and one female African-American senator. According to Rep. Yvette Clarke (D-NY), who currently holds Chisholm's seat in the House, the former congresswoman's commitment to her constituents and her historical position "helped to demystify the misconception of black women," establishing a role for them in national government and policymaking. "She was always working for people [who] didn't have political action committees," former Rep. Schroeder says. "She worked as diligently for them as if they were General Motors or something." Schroeder says that one of her fondest memories of Chisholm occurred late one night when Schroeder's daughter, about 5 years old at the time, was talking to the congresswoman about her campaign for president. "If you got elected, would you keep the White House white?" she asked. "No," Schroeder remembers Chisholm saying. "I think I'd put polka dots on it of all different colors. Because that's how Americans come — in all different colors."